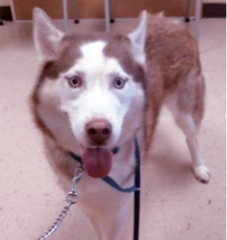 This is an unaltered male, Red and White Siberian Husky. ** Important ** If this is your lost pet, call (813) 744-5660 and visit Hillsborough County Pet Resources immediately at 440 Falkenburg Road, Tampa, Florida 33619. If you are interested in adopting this animal inquire by Animal Number A1981332 and visit the shelter at 440 Falkenburg Road, Tampa, Florida 33619. Hillsborough County Pet Resources is open for normal business (lost pets, adoptions, rabies tag purchases and investigations): Tuesday through Sunday, 10:00 AM - 7:00 PM. This animal has been at the shelter since Apr 18, 2019. PRIOR TO ADOPTION ALL INTACT ANIMALS WILL BE SPAYED OR NEUTERED. This animal's record may be found here. If you find any problems with links or images please notify the webmaster.